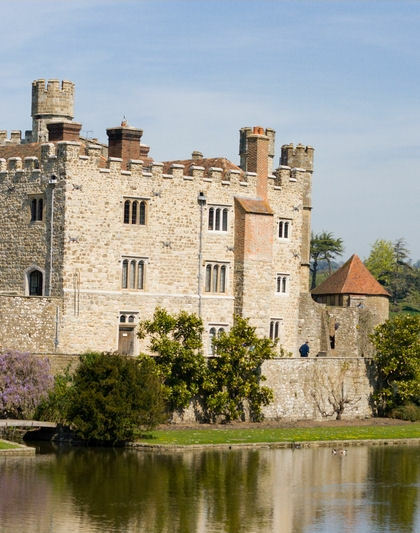 Imagine yourself on an island with 500 acres of beautifully landscaped parkland as you visit the Leeds Castle, which is situated in the heart of Kent countryside. Unusually located, it sits on an island, and its idyllic setting led Lord Conway to describe it as "the loveliest castle in the world". As one of the first groups to visit the castle, it will almost be a private visit! Then on to Canterbury, a fascinating medieval city that has been the center of English Christianity since St Augustine was sent here by Pope Gregory in 597 AD. The orginal church was rebuilt in the 11th century as the magnificent cathedral we will visit today. Of the 104 Archbishops to date, possibly the most famous is Thomas Becket,who was gruesomely murdered in the cathedral in 1170. Next you'll travel to the White Cliff's of Dover, a port for almost 2000 years. We will see Dover Castle, the White Cliffs of Dover and the English Channel. Greenwich, designed by Sir Christopher Wren, will be our next stop. The Old Royal Naval College dominates the waterfront and is an outstanding example of 17th century baroque architecture. You will also be able to see the famous Royal Observatory, housing the Prime Meridian. We will take a delightful cruise on the Thames River from Greenwich, past superb riverside views of London, to the Embankment pier. Make sure to bring your camera. Excursions listed for a port may not be available for every cruise.